A missing protein may be the culprit in millions of cases of male infertility, according to a report released Wednesday in the journal Science Translational Medicine. 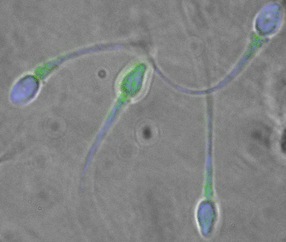 Researchers at the University of California, Davis, discovered that the absence of a protein that helps sperm swim through cervical mucus and “cloaks” them from the female immune system likely contributes to startling infertility numbers. In at least 20 percent of men, the genes that trigger the protein are mutated, leaving their sperm completely vulnerable and unlikely to make it very far. The finding may help unravel a riddle that has stumped scientists for decades: In 70 percent of infertile men, doctors can’t explain infertility based on sperm count and quality. Under a microscope, they look and swim normally. So they knew that some unseen factor was preventing them from doing their job. If additional tests confirm the findings, it may be a new era for many infertile men worldwide. In the United States alone, 10 to 15 percent of the male population has been diagnosed with the disorder. When it’s working properly, the protein acts “almost like a Teflon coat” for the sperm that enables it to swim more efficiently, said Dr. Theodore L. Tollner, a lead author of the report. The U.C. Davis team confirmed that sperm with the malfunctioning gene are far less likely to swim through an artificial gel that mimics female cervical mucus. When the normal protein is added, they have no trouble. Nonetheless, the evidence is encouraging, he said. Studying men in the U.S., western Europe, Africa, Japan and China, the U.C. Davis scientists and partner researchers throughout the globe found that about half of all men carry at least one copy of the defective gene. Just one copy usually doesn’t impact fertility rates, but a quarter of men have two copies — and that makes it extremely difficult for their sperm to swim through mucus. In China, 500 couples trying to conceive found that males with two defective genes conceived at a rate 30 percent lower than their peers. The widespread nature of the findings not only suggests the mutation is quite prevalent in nearly every population, but it probably developed long ago in the evolutionary process, Tollner said. Regardless, simply knowing about the missing protein opens the door for a slate of screening and treatment options for those experiencing infertility. In the future, “take-home kits” could be developed to help men easily discover through saliva or a cheek swab whether they’re missing the protein. Because early testing on non-human primates indicates the protein coating can be easily added to sperm, fertility clinics may one day help human couples conceive by applying the protein coat to sperm before performing intrauterine insemination and similar procedures. And while Tollner admits it’s “a bit speculative,” he says it would probably be easy to concentrate the protein in a vaginal gel or cream that coats sperm on their way into the vaginal tube. Image courtesy Theodore L. Tollner.